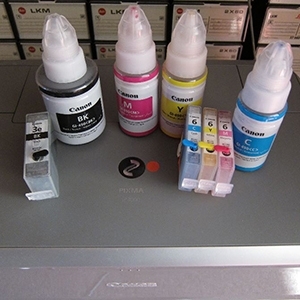 Discussion in 'Non OEM Ink & Cartridge Suppliers' started by UrbanDepartures, Apr 12, 2019. The CLI-8Y cart that came with the kit...i assume i still need to flush it...do i need to use windex type liquid or just distilled water like the other carts? Also, do i remove the chip from the OEM cart and put it on the CLI-8Y one yeah? If so, why not just use the OEM yellow? I managed to remove all the balls using the awl without a visit to A&E lol, as per Octos YouTube video...is it good practice to use the supplied silver tape over the plugs after filling with ink to increase the seal, dont get me wrong the plugs appear tight, im just concerned as they are tapered. Finally, are there any UK off the shelf (Tesco/Asda etc) alternatives to Windex...i recall reading on here about W5 stuff...i think thats Lidl? When you get the little ball out, it’s best to drill the refill hole so its straight, (remove the taper) and the plugs will fit far more comfortable then, but it’s not necessary, just like using belt and brasses. If your looking for Windex cleaner then you could try Halfords, but any window cleaner will work or just add 1% ammonia to it yourself. As your new to refilling it’s wise to follow the proper steps to be sure you get everything right, and patience is your best friend because there are no good shortcuts.. Cheers for the reply man, yeah im taking my time with it, reading/watching etc...want to get it right first time. I'll hit the shops in the morning. I'll sleep on the drilling idea, tho i know it makes sense, the plugs from Octo are tapered too, im worried that drilling (thus removing the taper from the cart) will make the plug not as snug?..i wish had those longer ones Jose uses in his videos but cant seem to see them online in the UK. EDIT...just saw a selection of plugs on ebay. You need have no worries about the tapered silicon plugs and the tapered (or straight holes), I have never had a leak from either. The Hat and UrbanDepartures like this. Epson, Canon, HP... A "few"
Thanks to @Emulator and @The Hat for manning the unofficial tech support desk while I was away with various family events. Agree with pretty much everything that's been posted up with a couple of small caveats. 1. The plugs are usually pretty reliable but occasionally a plug may work loose. Mostly it seems to be related to tape fragments drooped into the hole (or around the edge), ink acting as lubricant on the walls of the hole (cotton buds/q-tips help remove that) or just a bad moulding. 1b. Use of the tape is definitely belt and braces if you feel happier. 2. We do have some other plugs available for anyone who wants to drill out the internal lip at the bottom of the original fill hole then push the plugs firmly in. We just don't make them available as standard due to minimal stock and to avoid confusing new refillers with yet more options. UrbanDepartures and The Hat like this. Cheers for the input websnail, i ordered those coloured plugs off fleabay (before noticing your reply) and drilled the holes...super job. Carts flushed, dried, reset, filled and awaiting the impending low ink warnings. A final question...if my refilled carts are gonna be sitting about waiting, should i tape the vent holes, im assuming if the answer is yes its to avoid any evaporation/drying? I have a variety of CLl-8 and BCl-6 carts sitting around for months and some for a year, and I never cover the vent hole, and I reckon it allows the carts to breath normally, and that seems to work for me..
P.S. Store them in a cool place for added protection.. Cheers for the input websnail, i ordered those coloured plugs off fleabay (before noticing your reply) and drilled the holes...super job. Carts flushed, dried, reset, filled and awaiting the impending low ink warnings. A final question...if my refilled carts are gonna be sitting about waiting, should i tape the vent holes, im assuming if the answer is yes its to avoid any evaporation/drying? Not really essential but may be prudent if the cartridges are likely to be sat around for months. As easily you could stick them in zip lock bag and leave it at that.